28 Jesus knew that everything was now finished, and to fulfill the Scriptures he said, “I am thirsty.”  29 A jar of sour wine was sitting there, so they soaked a sponge in it, put it on a hyssop branch, and held it up to his lips. 30 When Jesus had tasted it, he said, “It is finished!” Then he bowed his head and gave up his spirit. They offer me sour wine to satisfy my thirst. About the 9th hour (Jewish time) or 3pm. 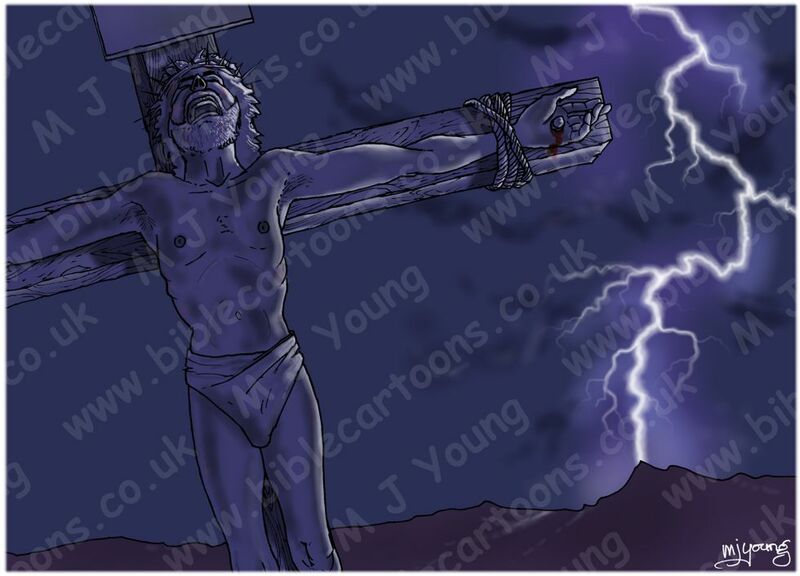 Although there is no mention of a darkening sky in John’s account of the crucifixion, for this illustration I have decided to show the darkening sky, lit by lightening, which produces a harsh outline to the scene. Jesus the Christ on the wooden cross. 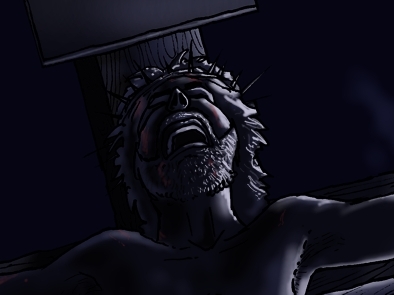 There are two versions of this scene: 1) “It is finished” (Dark version) & 2) “It is finished” (Light version). This scene is the lighter one, with paler dark blue & purple hues, designed for viewers who would like to see more of the figure & details of Jesus in this scene. The Dark version is the previous cartoon. I took photographs of myself in the posture of a crucified person. It felt quite humbling & meaningful, even to do that for this illustration. This illustration has been quite quick to draw & colour, because it is a fairly simple design. Having said that, I am very pleased with the result. 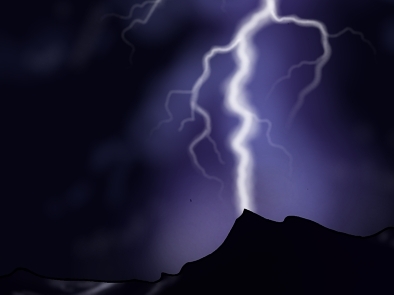 The dramatic lightning which lights the scene is bold & strong, which was just what was needed to illustrate this critical incident in the history of creation & the world. I am particularly pleased with the way the dramatic & stark lighting has come out. But what a subject! When I was colouring the strong highlights on Jesus’ face, I was enthralled & deeply moved by the look on His upturned face. 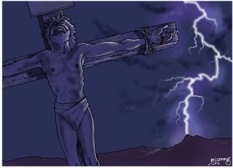 What pain & anguish Jesus must have felt as his life ebbed away, there on the cross. Yet he also knew that he was sacrificing himself for each & every one on us… to pay for our wrong-doing, & to replace our sins with his righteousness. That was what kept him there, to the bitter end. What an astonishing sacrifice Jesus made for you, me & everyone, everywhere. By dying on the cross, Jesus opened the way for each & every one of us to accept him as our Lord & Saviour, & so to have an eternal, living relationship with God – wow! No wonder this picture moved me so deeply. Close-up of Jesus’ head & expression. 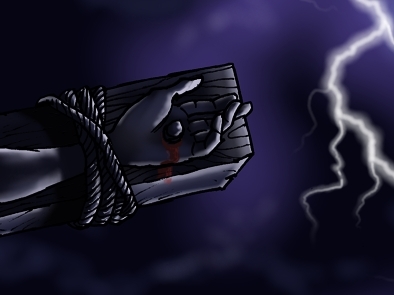 Close-up of Jesus’ hand on the cross.